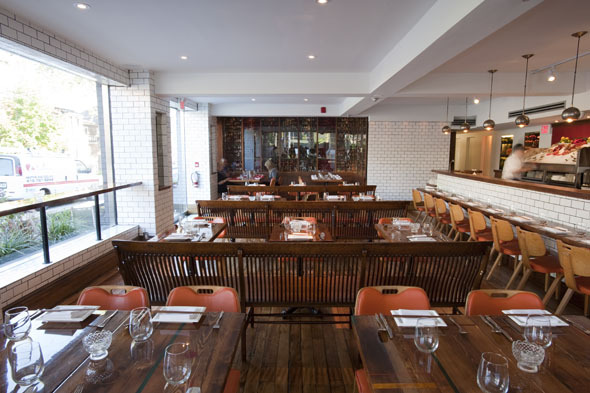 Bent is the newest member in Susur Lee's family of restaurants and recently moved into a cozy spot at the corner of Dundas and Markham. The highly anticipated new eatery sees Lee in charge of the kitchen (helmed by chef de cuisine Bryan Gunness, formerly of Lee ), while sons Levi and Kai Bent-Lee step into the spotlight and oversee the dining experience. The space is designed by Lee's wife Brenda Bent, and partner Karen Gable, and is a stark contrast to Lee. The decor here is light and fresh - described to me as "vintage industrial." 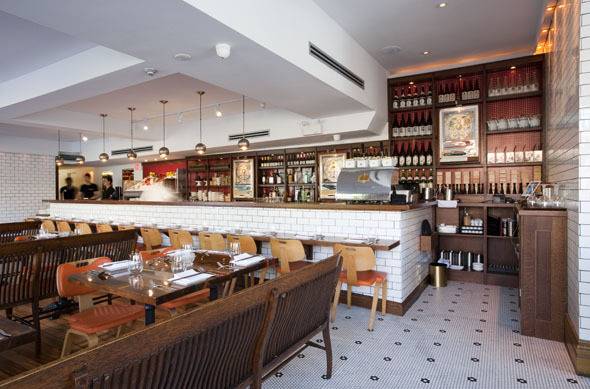 The predominantly white room is enriched by patterned tiles and warm pieces of vintage furniture, like the striped table tops and long, wooden church benches. 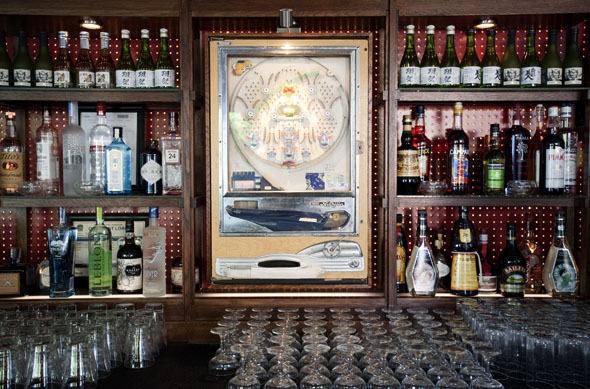 Fun touches like vintage Pachinko games (a Japanese arcade staple) and the terrarium hostess stations add character and a dash of whimsy. The menu features Asian flavours prepared with European techniques and vice versa; international flavours prepped with Asian techniques. Plates are small and meant for sharing, and the menu includes offerings from both the hot kitchen and raw bar. 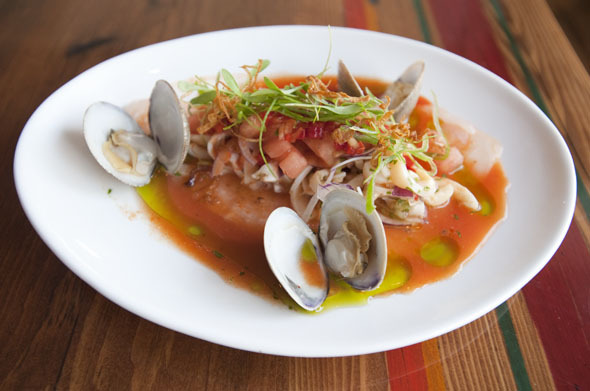 The Peruvian Style Ceviche ($15) is a brightly coloured plate of citrus dressed fish, generously topped with squid, clams and vibrant garnishes. The Nigiri Tasting ($14) showcases four selections from the raw bar served traditionally, but each enriched with a touch of something special. For instance, the hamachi is sprinkled with nori seasoning and scallion, and the magoro is brightened with red shiso and a white soy glaze. The Cantonese-style Braised Spiced Short Ribs ($22) are Susur's take on comfort food. Though incredibly elegant in its presentation, all the flavours here evoke home cooking. 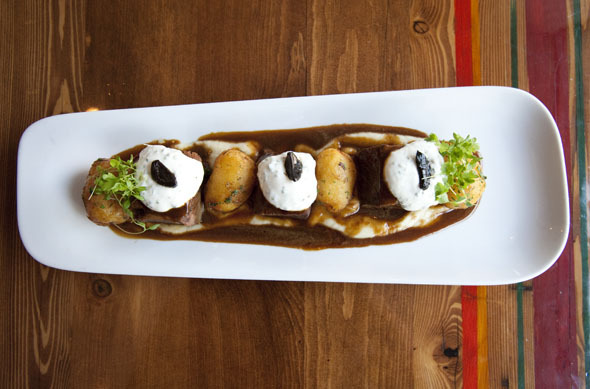 Tender beef is dolloped with chive sour cream and sweet black garlic cloves, and it arrives served with duck fat confited potatoes, parsnip purée, and the deliciously rich braising liquid. There is no dessert menu, but a trio of sweets arrives unsolicited and without any objections. Like the custom of serving an orange after the meal, the philosophy is to finish with a complimentary favour from the kitchen so, as Susur puts it, "you'll leave happy and with grace." 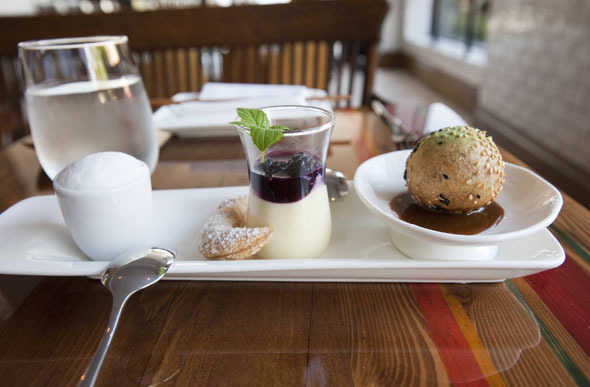 These are certainly generous offerings; the milk foam topped panna cotta, the lemon curd with wild blueberry juice and Ontario blackberries, and the improbably light Chinese rice doughnut coated in toasted sesame, and unexpectedly filled with peanut butter and chocolate. Sake is the beverage of choice here and the extensive selection even includes a locally-produced house blend. Also on offer are unique cocktails like the Asian Caesar ($16), spiced with a mottled blend of chili oil, corriander, sriracha, hoisin, soya and ginger. 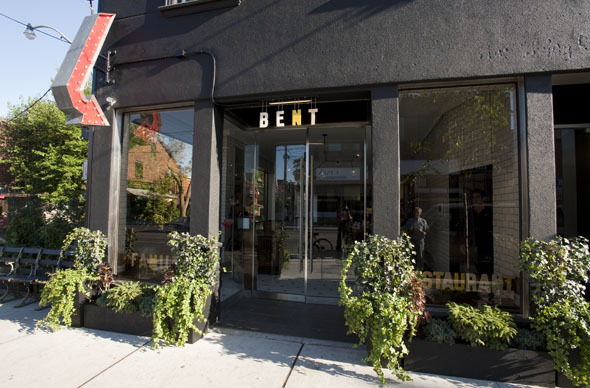 Bent aspires to be a casual destination and is sure to attract a mixed crowd of long-time Susur fans and local food enthusiasts alike. It's been open less than a week and is already a hotbed of activity.